Handicraft by Agis: Homemade yoghurt! As I grew up I knew that yoghurt somehow came from milk. Still, I had gotten the impression that one couldn't make yoghurt at home, because... well... just because! This notion stayed with me until just a few weeks ago, when I stumbled upon a recipe for homemade yoghurt. At first I thought "wow, this must be for those people who raise cows!" but looking closer I finally understood that no, this was something ordinary people could do in an ordinary kitchen using ordinary milk. I just had to try. So tonight I am proud to announce that my very first homemade yoghurt is done! 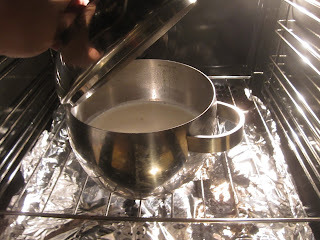 I heated the milk until it was almost boiling but not quite, and then let it sit for a while as the temperature dropped to about 40 degrees C. Then I added the two tablespoons of yoghurt (also just what I happened to have in the fridge!) and stirred. 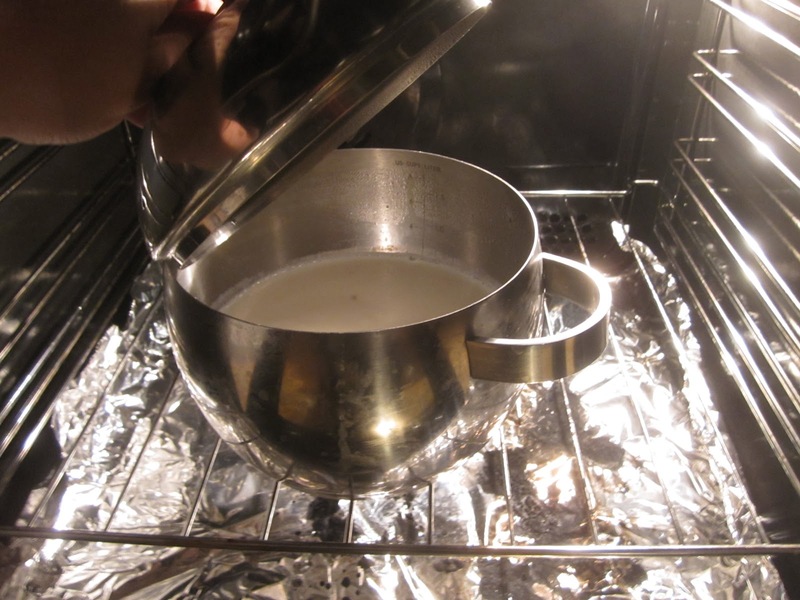 After that I put a lid on it and placed the whole thing in the oven. The oven had just been heated to 40 degrees C. After just a couple of minutes I turned the oven off completely but left the hatch closed so that the warmth would not escape too quickly. After 6 hours I opened the oven and checked the result. Oh yes, yoghurt! The bacteria in the small amount of yoghurt I added to the milk had reproduced and completely taken over, 'magically' turning the milk into mild and creamy yoghurt! Actually I found it a little too mild so I put it back in the oven to sit for another hour, then I'll put it in the fridge. It really is that simple! Have you ever made yoghurt? How did you do it?